MediBase was designed to help patients keep track of their medical information by storing all important data in one place. Your medical information is important. Most people have bits of this information scattered here and there. MediBase makes it easy to compile all this data into one place. It will print a complete report you can take to the doctor. It will also print custom organ donor cards you can carry with you. Upgrades are free for life. 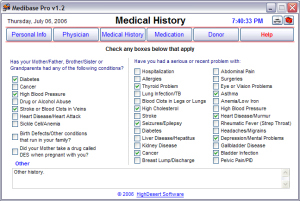 - Create unlimited patient databases. - Minor interface improvements. - Minor bug fixes.